Well-known as the “Min-Pin”, the Miniature Pinscher has been bred in Germany for hundreds of years. One theory is that it was developed by breeding the German Pinscher to Dachshunds and Italian Greyhounds to obtain a smaller-sized dog. It was one of the breeds included in the Pinscher-Schnauzer Club formed in Germany in the 1890’s. 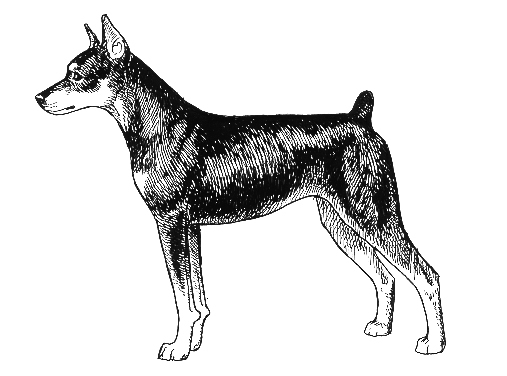 The Miniature Pinscher was recognized by the United Kennel Club in 1936. The Miniature Pinscher is structurally well balanced and sturdy. It is compact and short coupled. The breed is smooth coated and naturally well groomed. Characteristic of the breed is its hackney-like gaiting action. Faults: Structurally lacking in balance. In character the Miniature Pinscher is proud, vigorous and alert. It shows fearless animation and complete self-possession, accompanied by a spirited presence. The narrow, tapering, well-balanced head is in proportion to the body. The length of the muzzle should be equal to the length of the skull. There is a slight stop as the muzzle transitions into the skull. The head shows no indication of coarseness. The skull appears flat and tapers in width toward the muzzle. The muzzle is strong, rather than fine and delicate. The top line of the muzzle is parallel to the top line of the skull. The cheeks are smooth and well chiseled. The lips are taut and closely adherent to the muzzle. Meet in a scissors bite. A full compliment of teeth is preferred, but a few missing teeth are acceptable. The full, slightly oval eyes are clear, bright and dark, almost a true black. Black dogs have black eye rims. Chocolate, blue & fawn (Isabella) dogs may have a lighter eye pigment and have self-colored eye rims. The nose is black, except in chocolate-colored, blue and fawn dogs, which have self-colored noses. The ears may be cropped or uncropped. They are set high and stand erect from the base to the tip. The slightly arched, clean, muscular, gracefully curved neck blends smoothly into the shoulders. It is in proportion to the head and body. The clean, sloping shoulders have moderate angulation, coordinated to permit the hackney-like action. The forelegs have strong bone development, and small, clean joints. When viewed from the front, they are straight and upstanding. The elbows are close to the body. The pasterns are strong and perpendicular. Removal of dewclaws is preferred but not mandatory. The muscular, compact body is slightly wedge shaped. The ribs are well sprung. The forechest is well developed. The base line of the brisket is level with the point of the elbows. Whether gaiting or standing, the topline may be level or slightly sloping. The croup is level. The loin is short and strong. The belly is moderately tucked up. In proportion, males appear square, measured from the breastbone to the back of the thigh and the top of the withers to the ground. Females may be slightly longer. Viewed from the rear, the hind legs are straight and parallel. Viewed from the side, they present a well-angulated appearance. The thighs are well muscled. The stifles are well defined. The rear pasterns are short and set well apart. Removal of rear dewclaws is preferred but not mandatory. The small, catlike feet have strong, well-arched, closely-knit toes. The pads are deep. The nails are thick and blunt. The tail is set on high and held erect. It is generally docked in proportion to the size of the dog. The short, smooth coat is hard, straight and lustrous. It closely adheres to, and uniformly covers, the body. Faults: Thin, too long, dull coat. ● Stag red, which is red with an intermingling of black hairs. ● Black, with sharply defined rust-red markings on the cheeks, lips, lower jaw, throat, twin spots above the eyes and chest, on the lower half of the forelegs, inside of the hind legs and vent region, on the lower portion of the rear pasterns and on the feet. Black pencil stripes are found on the toes. ● Chocolate, with rust-red markings found as specified for the Black dogs, except that brown pencil stripes are found on the toes. ● Blue with rust-red markings found as specified for the Black dogs, except that blue/gray pencil stripes are found on the toes. ● Fawn (Isabella) with rust-red markings found as specified for the Black dogs, except that fawn pencil stripes are found on the toes. In the Solid Red and Stag Red, a rich, vibrant medium to dark shade is preferred. Disqualifications: Albinism. Any color other than those listed. A thumb mark, which is a patch of black hair surrounded by rust on the front of the forelegs between the foot and the wrist. On chocolate dogs, the thumb mark is chocolate. On blue dogs, the thumb mark is blue. On fawn dogs, the thumb mark is fawn. White on any part of the dog that exceeds one-half inch in its longest dimension. The acceptable height range is from 10 inches to 12½ inches. Weight is in proportion to the build, neither too fat nor too thin. Eliminating Faults: Height under 10 inches or over 12½ inches. The fore- and hind legs move parallel, with the feet turning neither in nor out. The hackney-like action is a high-stepping, reaching, free and easy gait in which the front leg moves straight forward and in front of the body, and the foot bends at the wrist. There is a smooth, strong drive from the rear. While gaiting, the head and tail are carried high. Height under 10 inches or over 12½ inches. A thumb mark, which is a patch of black hair surrounded by rust on the front of the forelegs between the foot and the wrist. On chocolate dogs, the thumb mark is chocolate. On blue dogs, the thumb mark is blue. On fawn dogs, the thumb mark is fawn. White on any part of the dog that exceeds one-half inch in its longest dimension.